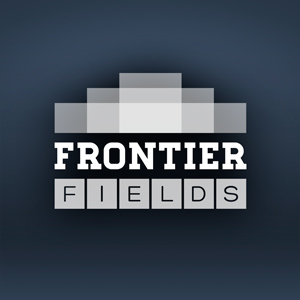 This is the third in a series of posts introducing and providing essential facts about each of the Frontier Fields. MACS J0717 has been observed by telescopes in many visible and invisible wavelengths of light. It is one of the most massive galaxy clusters known, and it is the largest known gravitational lens1. Of all of the galaxy clusters known and measured, MACS J0717 lenses the largest area of the sky. The Massive Cluster Survey (MACS) contains a sample of more than 100 galaxy clusters, measured by the ROSAT telescope to be bright in high-energy X-ray light. The goals of the MACS survey are to categorize and better understand distant massive galaxy clusters. J0717 has the highest X-ray temperature in the MACS survey. Left: The locations of Hubble’s observations of the MACS J0717 galaxy cluster (bottom) and the adjacent parallel field (top) are plotted over a Digitized Sky Survey (DSS) image. The blue boxes outline the regions of Hubble’s visible-light observations, and the red boxes indicate areas of Hubble’s infrared-light observations. A scale bar in the lower left corner of the image indicates the size of the image on the sky. The scale bar corresponds to approximately 1/30th the apparent width of the full moon as seen from Earth. Astronomers refer to this unit of measurement as one arcminute, denoted as 1′. Right: Hubble’s view of the galaxy cluster is displayed using archival visible-light observations. Deeper Frontier Fields observations of MACS J0717 are planned for 2014 and 2015. Left Credit: Digitized Sky Survey (STScI/NASA) and Z. Levay (STScI). Right Credit: NASA, ESA, and H. Ebeling (University of Hawaii).